Dr. G.A. Swanson was an American organizational theorist, and a tenured Professor of Accounting and Business at Tennessee Technological University (1982-2009). ?He was known for his accounting theories based on James Grier Miller?s general living systems theory (LST) and his passion for social scientific research. He served on editorial boards of Systems Research and Behavioral Science, Systems-Journal of Trans-disciplinary Systems Science, Journal for ?Information Systems and Systems Approach and International Encyclopedia of Systems and Cybernetics. Swanson was president of International Society for the Systems Sciences (1997).
? Dr. Swanson was awarded an Institute of Internal Auditors Research Foundation Fellowship (1989-90), a D.Litt. (1991) ?at the Oxford Graduate School, a College of Business ?Administration Excellence in Overall Performance Award (1997), and a College of Business Administration Foundation Award for Outstanding Research (1987, 1993, and 2004).? As the author of many texts and Journal articles, together with his passion for research in the integration of religion and society, he was an inspiration to me. His wise counsel through the years was appreciated and most meaningful. Dr. Green co-author two texts with Dr. Swanson, Understanding Scientific Research (A Handbook for the Social Professions) (1992) and Research Methods for Problem Solvers and Critical Thinkers (2009) scheduled for publication in 2013.
? A search on the Internet will show an extensive?list of research texts and Journal articles in his academic field.? 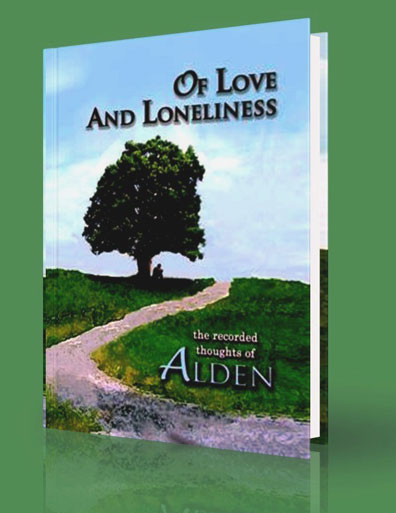 This book , Of Love and Loneliness, published under his middle name ?ALDEN? is the his last book and the only informal book written by Dr. Swanson during his long academic writing career.? It was published the week of his death. He used his middle name so as not to distract from his many?academic publications.